The App Store is hardly lacking for games that let you scratch that itchy trigger finger—particularly if your notion of an ideal shooter involves finding big game in the sights of your virtual weapon. If hunting games strike your fancy, Glu adds another dimension to the genre with Deer Hunter 3D. Hunting in a Winter Wonderland: The graphics are gorgeous in Deer Hunter 3D, but the controls aren’t always reliable. 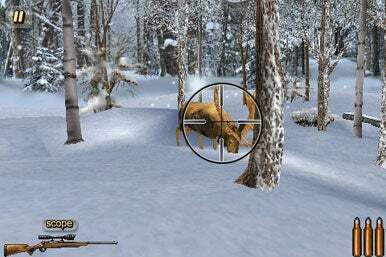 Deer Hunter 3D sports Quick Game and Hunting modes, wherein you can either quickly choose from a level, difficulty setting and weapon you’ve unlocked for a quick round or continue a more formal hunting campaign. The game pulls all this off in fine style, thanks to good graphics, detailed terrain, and realistic sound effects (though, unless a framed photo of Ted Nugent adorns your mantle, the ’80s-style rock ballad theme will be of minimal entertainment). Additional bells and whistles include a well-constructed hit engine that demands more accurate hits as the difficulty levels increase and additional bonus points for using less wieldy or shorter range weapons such as the shotgun or compound bow. While Deer Hunter 3D has its strong points, there are also a few drawbacks to keep in mind. Tracking prey is as simple as following footsteps on an overhead map, but the game’s objectives feel limited in that the only way you can fail is to shoot does; the game punishes you by awarding you none of the bonus points necessary to advance to the next level. More significantly, Deer Hunter 3D’s controls feel shaky and unreliable. It’s far too easy when attempting to hit the Scope button to fire off a round by mistake, which scares away your prey. The Steady button, which temporarily centers the rifle, feels awkward to access in its current central location. Finally, Deer Hunter 3D lacks a global scoreboard makes bragging about a masterful kill that much more difficult. Additional locations to hunt in would add some much-needed variety to the game. That said, Deer Hunter 3D has some genuinely fun moments and the app runs well. Without a global scoreboard or other incentives to play for, though, the objective of the game seems to amount to little more than unlocking every level and every available weapon. Fans of the Deer Hunter series will enjoy it, but for others, the thrill of the hunt might soon wear thin. Deer Hunter 3D is compatible with any iPhone or iPod touch running the iPhone 2.2 software update.